Google didn't seem to make sense, then I thought to myself how would it be possible that this book was in German but not in French or English? My point was there should be an English or French version. 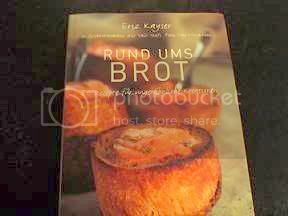 Then, it dawned on me, YES, this book is in English under a different title - "Beyond The Bread Basket." This was not the first time that I bought same book twice, or same CD twice, or same clothes twice (or thrice, in different colors). On page 130 of this latter book, it says the bread is a Pink Caramelized Almond Bread, using pink caramelized almonds (Oh, not pink pralines again!). I cannot get my hands on these pink pralines because G. Detou has been politely avoiding my small order (more trouble than what it's worth to them). 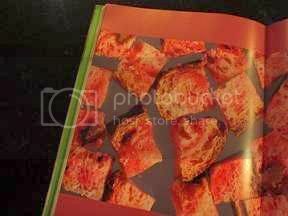 Eric Kayser's recipe has butter, sugar, milk, cream - the full Monty. While the quantities are not large enough to qualify this bread as a brioche, I am not going to go that route again - sourdough breads really don't need them. The question remains - where would I get the red color? Ahh, beetroot, my vegetable dye! I once made a beetroot walnut chocolate cake that my son absolutely loved. Think of a carrot cake that is full of walnut and chocolate pieces, then substitute beetroot for carrot! You get an absolutely moist cake which guarantees you full degustation by the kids. Beetroot is so good for them (and us). I thought it would be interesting incorporating this ingredient into a sourdough bread. Walnut would normally be a good pairing except, hey, why not test out new choices (well, fine, almond is not new). The white color of almond slivers is infinitely more attractive against the red of beetroot. So, here we go, we've got all our constituents lined up. * I could easily get fresh beetroot and slow-roast it in oven to cook it, but it would be more work than challenge at this stage. I need to work out the moisture content of these red darlings in order to get my dough hydration right. I am shooting for 67.5% dough hydration, not very aggressive. My technique is as yet not very good for high hydration dough. I am working on 50% weight in beetroot as extra hydration for dough. 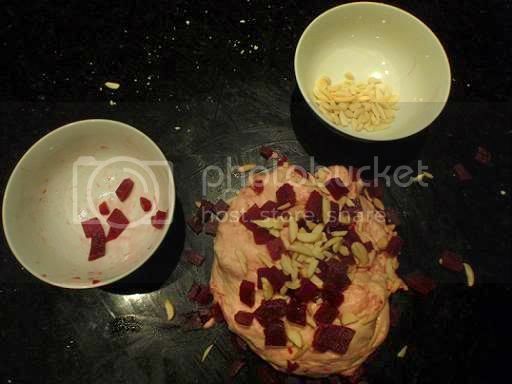 * I am working on a combined almond & beetroot ratio of 40% flour, which may seem high for some. Other than these, I have resisted the temptation of using any flavor improvers. (But salt? No, I'd like to think it is there for the integrity of gluten development.) As for the instant yeast, well, call me a chicken. Then, all of a sudden, after 6 - 7 min of kneading, it all came together. I just went and had a peep. 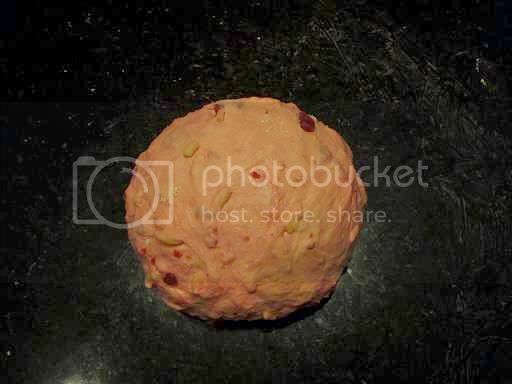 At this very moment, the dough is peacefully going through its first-fermentation. I shall return after a short night's cap myself to report on its further development. It sang when it came out of the oven for over 3 min! My son said, "Why is it crackling?" My daughter asked me what bread that is; I said, "Beetroot and Almond." She goes, "Pee-Yew!" So, there you go - one person's glorious bread is another person's pee-yew. 1. Shape and color: I am happy with the boule shape and scoring but am disappointed that the pink disappeared. 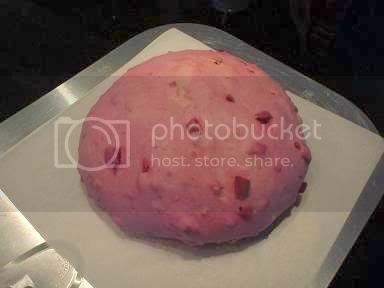 (It was hot pink throughout, inside and out, before it was baked.) Nontheless, the color of the crust is what I look for in a well-cooked loaf, warm, like harvest in autumn. 2. Aromas: The aromas from the crust, as well as from the crumb, are pleasant but faint even though the crust sang loudly as the bread came out of the oven. In truth, beetroot is not one of those vegetables that gives off strong odors. 3. 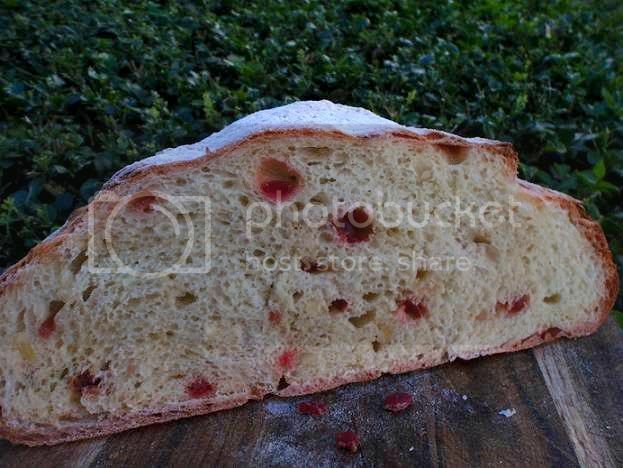 Crumb: To my surprise, the crumb is distinctly creamy (or even golden) in color, despite the red dots of beetroot scattered about. Its texture is elastic, typical of sourdough breads, and at the same time, moist and tender. 4. Flavors: Beetroot has a very faint sourness, as well as sweetness, taste. Its color not withstanding, it does not have a domineering taste. So as slivered almonds. 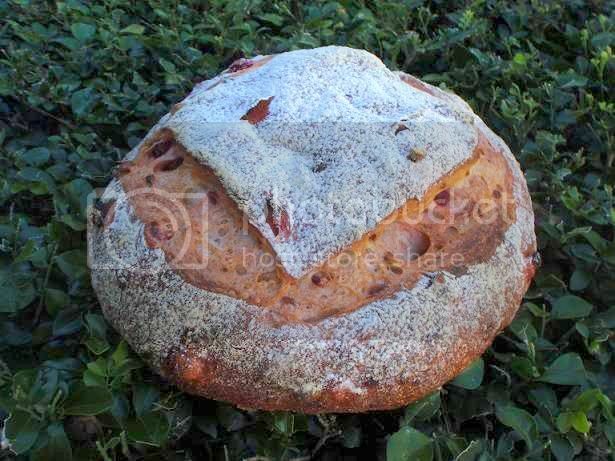 As a result, the flavors of this sourdough bread are those of a classic white sourdough bread with a bit of interesting features thrown in; ie, red dots for visual, and crunchiness (of almonds) for extra texture and mouthfeel. Well, it's not a bad sourdough (but no where near what the subject title of this post has announced!) . My son has already told me, "Oh, I am not eating that!" I am sure if the red dots in the bread are replaced by brownish chocolate bits, he'd be racing to have a piece. My kids know their mother is someone who likes to have her imagination run free. Their constant complaint is their mother ceases making them something once perfection is reached; she moves on to something else. Memory does not condition my choices. I like to try new frontier. Beetroot Salad Sourdough (another "pee-yew" idea?). Shred raw beetroot and marinate it in lemon juice, salt, and a little bit olive oil; use the resulting red juice as part of the hydration for the dough, and mix in the raw beetroot in the dough. The long fermentation will moderately cook the raw beetroot and hopefully still give some crunchiness to the soft crumb. That would be awesome! Thank you so so much. I remember your famous 1-2-3 method and have tried it with very good result. Maybe it's time that I spare Thomas (is that his name?) at G. Detou the headache. I shall contact you via email. but I would not use raw beet root in your next loaf. Raw roots may contain "rope" and ruin your bread within days. Please cook it first. HERE IS A LINK to check out. What applies to potatoes stands also for beets and carrots. Might I suggest putting cooked beets in a blender to improve the pink color? Check out the PURPLE PIZZA posted not long ago for ideas about getting the color. I think you could get away with adding water from the recipe to puree the beets, you could hold some of the water back and add it later if you need to. Thank you for the info and the purple pizza link. It is a great idea to use the puree beets! Thanks again. Perhaps your next try might involve roasting the beets first! I came across this recipe on the web. Your kids wouldn't even know what hit them! the roasted beet bread is divine. Thank you so much for the link. I have been reading about the interest in pink dough staying pink after baking. An NHK program featured a baker in Japan who encased the pink dough in a white outer dough. The color stayed! I just tried it using Persian mulberry juice for the water of a the recipe (enriched; E. Staebler) and it worked too. The yellow loaf is made with carrot juice.